Festus Keyamo, the official spokesperson for President Muhammadu Buhari’s re-election campaign, has opined why some leaders of the Peoples Democratic Party (PDP) protested at the headquarters of the Independent National Electoral Commission (INEC). The PDP protesters led by Senate President, Bukola Saraki, are demanding the cancellation of the recently concluded re-run governorship election in Osun State. The PDP members are also demanding the declaration of their party’s candidate, Ademola Adeleke, as winner of the election. Mr Adeleke lost to Gboyega Oyetola of the All Progressives Congress (APC) in the Osun election after a controversial rerun exercise in seven polling units. Mr Saraki until recently was a member of the APC. He was appointed head of the PDP National Campaign Council for the Osun guber poll. Among the protesters are: Aminu Tambuwal, Sokoto State Governor; Sule Lamido, former governor of Jigawa State; Uche Secondus, the national chairman of the opposition party and Senator Ben Murray-Bruce. The presidential spokesman said Nigerians were mocking the protesters while they were demonstrating at INEC Headquarters. “Some Nigerians I saw were laughing out so loud today when they saw pictures of some known masters of rigging ‘protesting’ at INEC office against ‘rigging’ in Osun State,” Mr Keyamo said on Friday. “I therefore concluded that the protest was more about the refusal of INEC to allow them practice their trade,” he added. 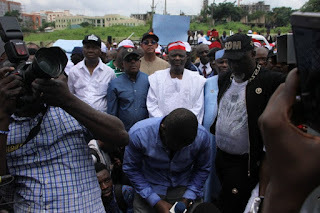 However, NGPOLITICS gathered that while the protesters were protesting, the Nigeria Police Force (NPF) allegedly fired teargas in a bid to disperse them. There has not been a formal reason for the Police action from the force headquarters.